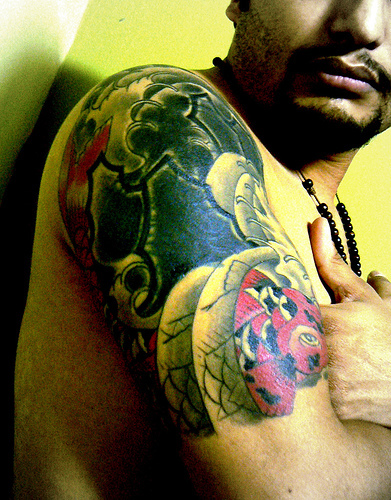 Tattoo is a form of body art created by inserting ink deep into the skin. In the world of tattoos, Chinese and Japanese tattoos like koi fish, dragon tattoos and lotus flower tattoos hold a special attraction, due their unique beauty and deep mysterious meanings. 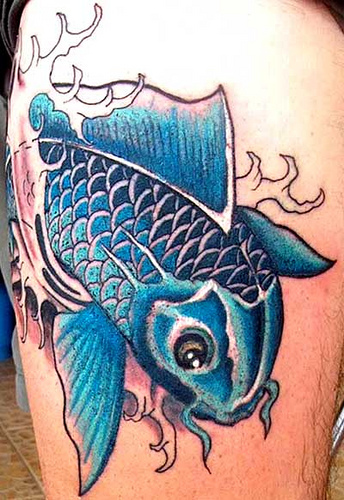 In recent times, the popularity of tattoos of koi fish are growing tremendously in Western countries and more and more men and women are getting with these beautiful fish tattoos with striking colors and designs. 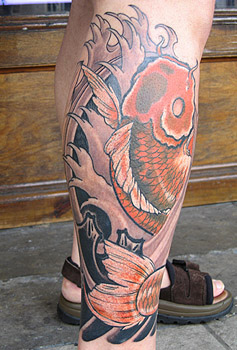 Koi fish or cyprinus carpio actually belongs to the same family as that of carp and greatly resemble large goldfish. They are found in a wide range of colors including black, white, red, blue, yellow and gold. This highly energetic fish holds a special place in both Chinese and Japanese mythologies and legends. Koi is a very beautiful fish with bright and striking colors, which has been cultivated and bred by the people of Japan for hundreds of years. 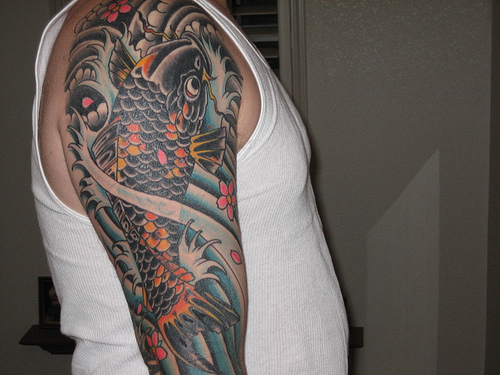 Japanese koi fish tattoos denote both good luck and strength. They are believed to bring riches and abundance. Koi fish has the innate ability to adjust to any environment and swim against the current of water, which are considered as very rare qualities. 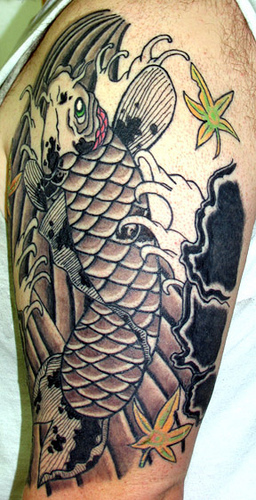 In both Chinese and Japanese culture, a very popular and mysterious legend is associated with koi fish. It is believed that these fascinating creatures, swimming upstream against the current of water will transform into water dragons, if they can reach a point known as ‘Dragon Gate’ in the Yellow river. But, swimming upstream is not an easy task, and requires a great degree of determination, ambition and strength. This story highlights the importance of strength and perseverance in the face of adversity to achieve success in the struggle of life. It also points to the fact that hard labor and determination can never go unrewarded. 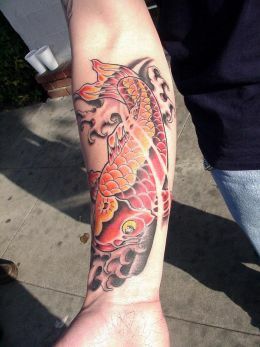 Other meanings attached to koi fish are wisdom, knowledge, ambition, loyalty and longevity. In Japanese culture, koi fish are also a symbol of masculinity, and their courage is compared with that of the Japanese Samurai warriors. It is a popular custom in Japan to display flags with koi fish images on the birth of a son. Koi fish are so much loved by Japanese people that flags designed as koi are raised on Children’s Day, usually black koi for father, red for mother, blue and white for boy, and pink and red for girl. They also hold a special place in Buddhism, being a symbol of courage, for their ability to complete the journey through the ocean. 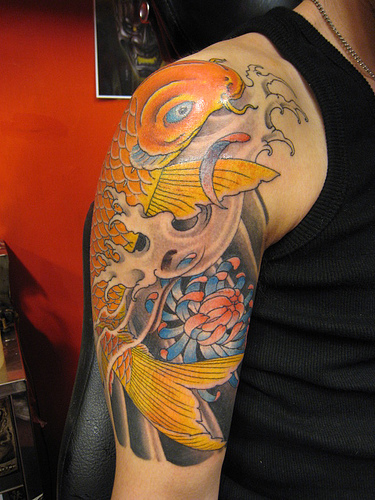 Koi fish are usually depicted in black and white color with lots of energetic movements, though brighter hues like gold, yellow, red and blue can also be used to make this tattoo more striking. 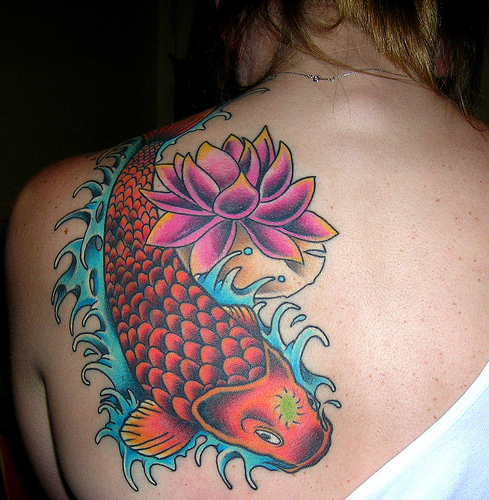 Generally, the natural beauty of their colorful scales are captured with the help of intricate shading. 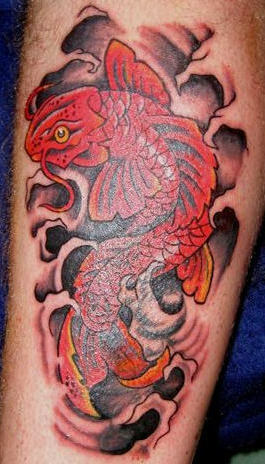 The most widely used background for koi fish tattoos are flowing or splashing water. Koi fish are often seen as leaping out of water with a splash of water around, which represents the act of overcoming the obstacles of life. They can be excellent tattoos for wrists, feet and shoulder blades of a woman. 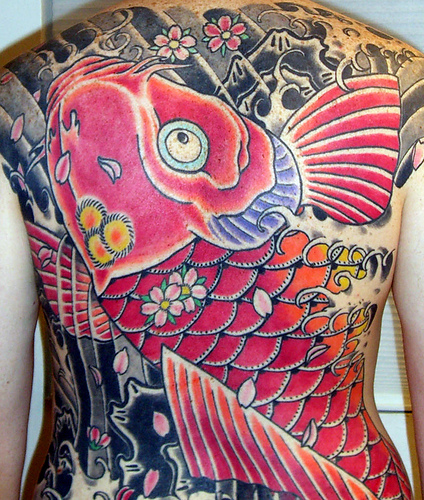 For men, the most popular places to sport this tattoo are the back and shoulder. 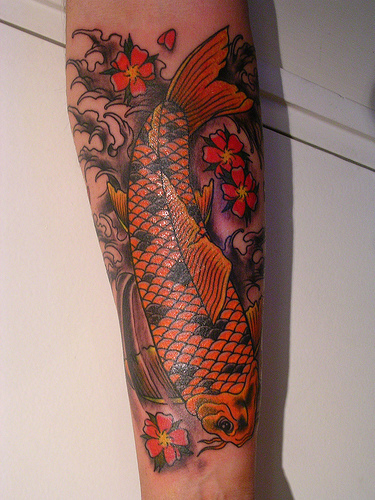 But it is also suitable for other places like forearm, chests and ribs and a koi fish tattoo on the forearm can look really masculine. 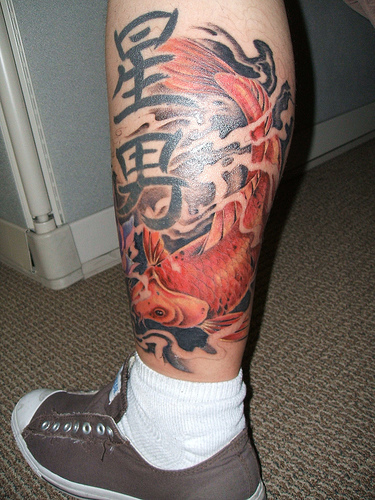 Men generally prefer the masculine version of Japanese koi fish tattoos, where the legend of transformation of koi fish into dragons is depicted. 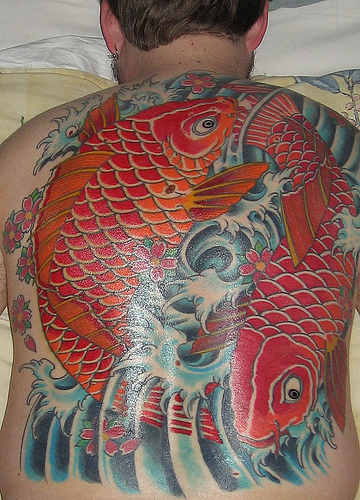 A full back spread can be created to portray the journey and transformation of koi fish at the dragon gate fall. 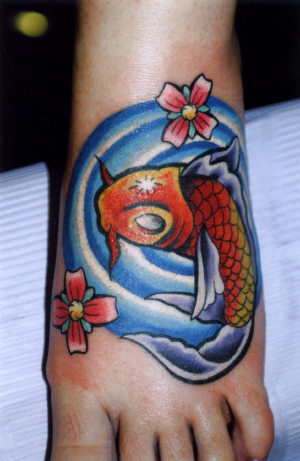 For giving a more exotic look to Japanese koi fish tattoos, they are often portrayed with backgrounds that include flowing water, floating cherry blossoms, or lotus flowers. 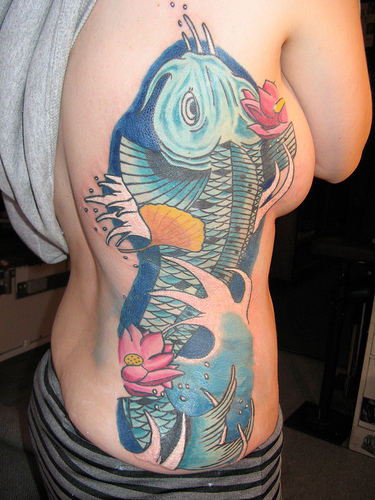 They are also great to create zodiac tattoos, especially Pisces zodiac tattoos. 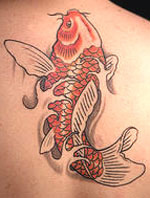 For creating Pisces zodiac tattoos with koi fish, one has to simply replace the symbolic curved lines of this zodiac sign with two koi fish. 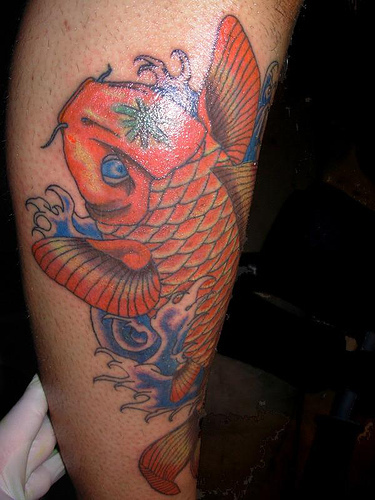 By choosing a right color scheme along with a suitable location and intricate designs and shades, you can create some truly fascinating koi fish tattoos. 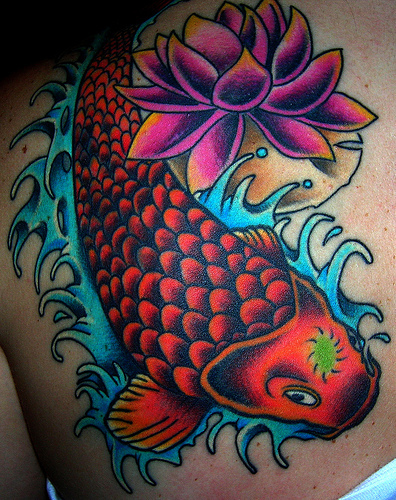 Moreover, the myths and legends associated with koi fish tattoos will always inspire you by reminding you of the importance of courage, strength, ambition and perseverance to leap out of crises and embark on a voyage to reach your destination.